Dr. Karimi continues to be actively involved in researching minimally invasive facial rejuvenation he has been named the national Medical Director for CosmoFrance and has continued to educate himself, the public and his peers on the latest facial aesthetics techniques. Dr. Karimi, the elite facial plastic surgeon has joined the esteemed Haute Beauty network. Haute Beauty well known for their exclusivity is honored to partner with Dr. Karimi as a leading Cosmetic Dentist and our newest addition to the Haute Living Network. Dr. Karimi is nationally recognized and had been featured on favorite television shows including as EXTRA! and CBS “ The Doctors”. His ground-breaking, minimally invasive methods have captured the attention of potential patients throughout The United States. Dr. Kian Karimi MD, FACS is a double-board certified facial plastic surgeon specializing in head and neck surgery. Dr. Karimi is a native of Indiana, where he received his medical degree from the Indiana School of Medicine. Dr. Karimi proudly graduated top of his class earning him the prestigious membership into the Alpha Omega Alpha honors society. Dr. Karimi continued his graduate career at the University of Florida where he went on to complete his residency. Dr. Karimi then relocated to Toronto Canada where he received his fellowship in facial plastic surgery from the University of Toronto. 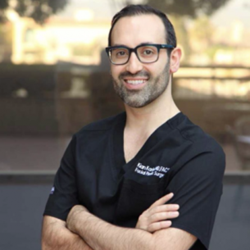 Dr. Karimi is actively involved in the plastic surgery community; he maintains an active practice located in Los Angeles, California. His practice caters to clients considering facial plastic surgery, head, and neck surgery as well as skull-based surgery. He is currently serving his fifth year as a surgeon for the Los Angeles Kings Hockey organization.